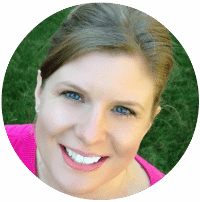 Inside: Trying to declutter and get rid of stuff? Check out the 9 things to get rid of today. Sell them, donate, give it away and get it out of your house today! 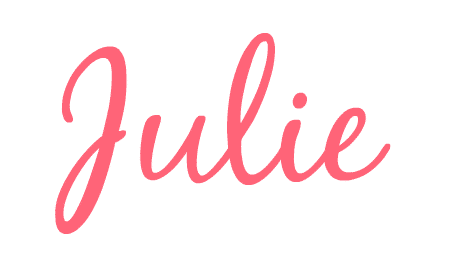 Recently I have been working on decluttering/organizing my house. In the past, we would move every 2-3 years and I would go through everything and get rid of a bunch of things. Now we have been at the same house for over 10 years and it is full of stuff that we don’t always use. It’s often hard to get rid of things that have sentimental value to you, but there are other things you could probably just donate and never think about again. 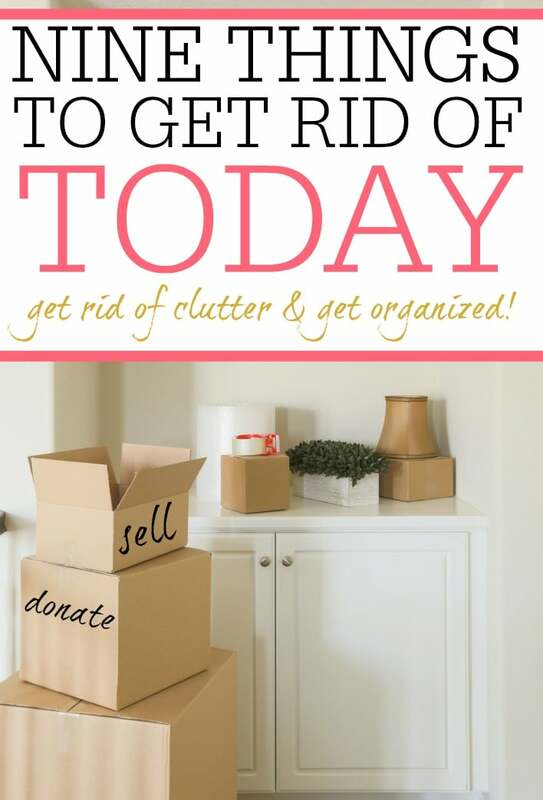 If you are trying to declutter your house check out these 9 things to get rid of today. You won’t think twice about donating these things that are just cluttering up your home. Clean off those bookshelves and get rid of the books you don’t read anymore. Not only will your bookshelves look less cluttered you could possibly make some money too. I cleaned off my bookshelves this summer and got rid of about half the books. It looks way better, it’s more organized, and I made some extra cash selling my books at Half Price Books. Those old bikes, scooters, or sports equipment are just taking up room in your garage making it seem so cluttered. 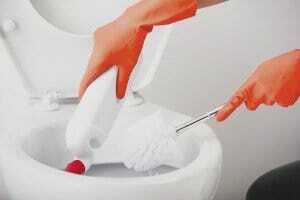 If you don’t ever use it or your kids have outgrown it get rid of it today! Get rid of that unused sporting equipment fast using craigslist or sporting resalers. I have had luck selling old sports equipment on eBay or at Play It Again Sports. Remember the days before iTunes and Spotify? Everyone had big CD collections and tons of CDs in the car and house. Now all I ever use is my phone and echo dot. Send those CDs to a donation site today and clear up some more space in your house. If you have old jewelry that you don’t wear anymore get rid of it. I tend to buy inexpensive earrings and then only wear them a couple of times. All they do it clutter up my bathroom. It’s not always something we think about getting rid of, but if you have some jewelry that doesn’t have any sentimental value to it donate it or throw it out today. I am guessing about 50 percent of homes have some rarely used exercise equipment. For us, it is an old elliptical. I loved the elliptical at the gym, so I picked up a cheap one for at home. It turns out that there is a big difference between a $100 elliptical and a couple thousand dollar one at the gym. I hated the one we bought and never used it. I sold it and made some extra cash. Dust off that old exercise equipment and list it on Facebook or Craigslist. This is one of the best things to get rid of today. Every time I get flowers delivered they come in the glass vases. You would think after a while I would stop washing them out and saving them. I recently cleaned out the storage in my dining room and found 5 florist vases in addition to my good vase. I purged all but one. If you have those old florist vases laying around get rid of the extra. Chances are you won’t need more than 1 or 2 at the most. Clothes you don’t wear anymore is definitely one of those things you need to get rid of today. If you don’t fit into now get rid of it. You can keep your closet looking nice and well organized when you have fewer clothes. 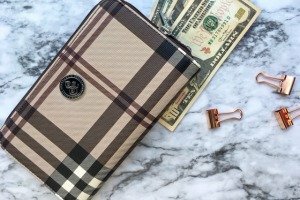 Donate it, send it to goodwill, or sell it but get rid of those old clothes. 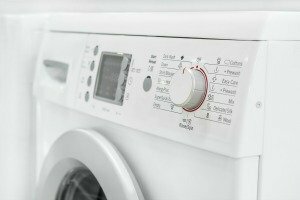 Get rid of that rarely used kitchen appliance or gadget and make some extra money. I had a bread maker that I never used and was able to make $25 selling it on craigslist. Go through your cabinets and drawers to find those gadgets you need to get rid of. I am bad about keeping old phones around longer than I should. I just recently got together some of them and sold them to Amazon. It was great because they were just cluttering up our drawers and I was able to make some money off the old phones. Getting rid of things and decluttering is never easy. 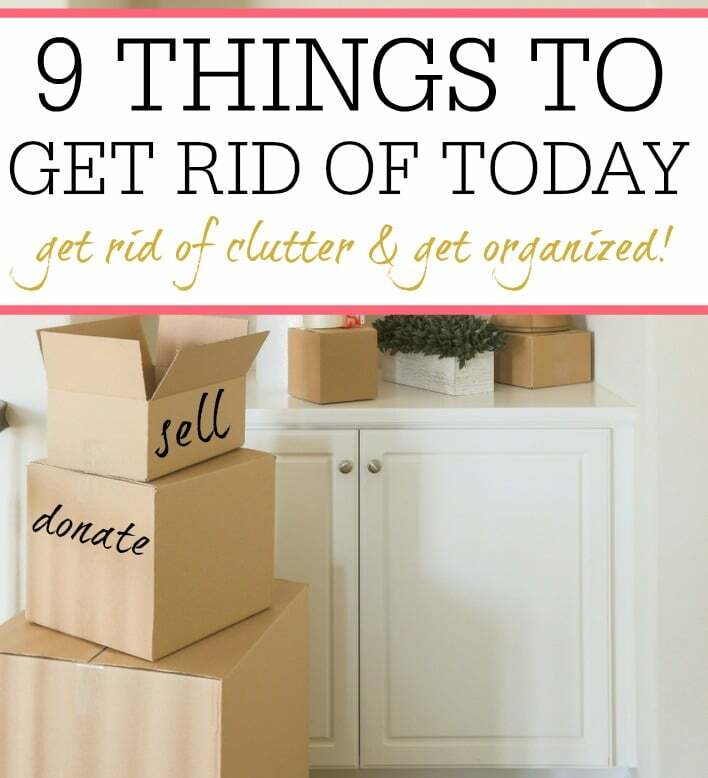 However, these 9 things to get rid of will get you started down the right path to getting rid of clutter. 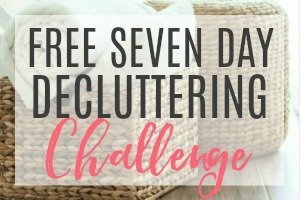 Want some more tips to help declutter? 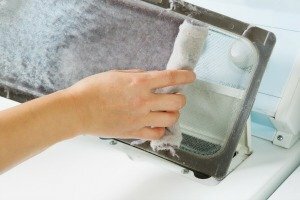 Check out these 5 simple tips to stop clutter. You’ve given us some good ideas here. Thanks! Great suggestions!…… but I still listen to my CDs. I’ve saved two tall vases that I have under my kitchen sink and half bath sink for those grocery plastic bags. Double duty. Love it! What a great way to repurpose. Thanks for sharing.